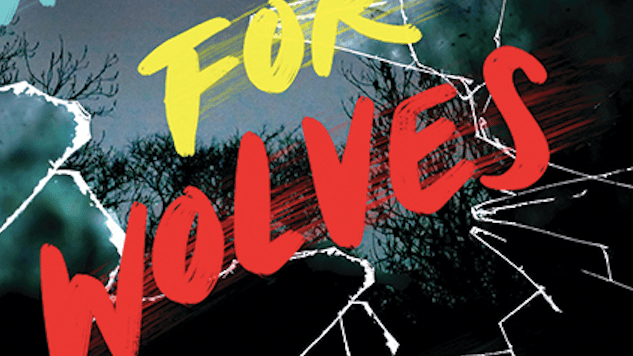 Kosoko Jackson’s debut novel, A Place for Wolves, is one of our most anticipated books of 2019. Drawing comparisons to acclaimed novels like Aristotle and Dante Discover the Secrets of the Universe and Code Name Verity, it’s a Young Adult historical thriller from a powerful writer. James Mills is used to being in different countries—Egypt, Russia, Kenya—he’s had some tense experiences in all of these foreign landscapes, thanks to his parents’ jobs. But this time is different. Now that his sister is in college, he’s stuck in a country he hates with no one to share the experiences with. Enter Tomas. Falling for him is unexpected and amazing, and helps James dismiss some of growing dissent bubbling to the surface. But when long running tensions explode, war erupts, and James and Tomas are faced with devastating violence, pain and cruelty. Separated from their parents, their only hope is to make the treacherous journey to the U.S. Embassy. They can only rely on each other, and they’ll have to decide how far they’re willing to go—and who they’re willing to become—in order to survive. We asked Jackson about the origins of the story, and considering the genuine place this novel comes from, it only fuels our excitement for its release. That’s not something you tell your sister in a letter. So instead I end it with ‘I’m scared,’ which will have to do. I read the end of the fifteenth letter to my sister three times before folding it up and slipping it into the envelope. Focusing on choosing the right words not only helped keep me distracted from the noises outside, but also helped me ignore the tightness inside my chest. I try to remember that. To remind myself that Tomas and I will be at the American Embassy in Pristina, Kosovo, by tomorrow morning. How exactly my Brazilian boyfriend will get past Embassy security is a problem we’ll face once we get there. More importantly, this’ll be all behind us by tomorrow. No more worrying about the riots outside. No reason to be nervous about the tension in the air. No reason to worry if I’m going to die in this cold-tundric hell. The only thing I have to worry about right is finding a way to get out of this hotel without waking Tomas. Even with the sounds outside that I hope are just cars backfiring, I can’t help but smile as I picture him in the next room. I can see him pushing his lips together in that way that makes them form into a thin line of disapproval. ‘You are not going out there to mail a letter, James,’ he’d say if I accidentally woke him. He wouldn’t be wrong. But he also doesn’t understand. Through every country, every trip, the one thing I’ve had to rely on is family. Also known as Anna Mills, Mom, and Dad. When things go wrong, the only person who is really there is my sister. And more importantly, when things go well, who was there to support me? Anna. And I’m always there for her. Her being 3,000 miles away at Georgetown doesn’t change that. If anything, it makes mailing this letter even more of a priority. I promised her I’d write, and I can’t stop now. A Mills doesn’t break his promise. Especially when there’s a chance, albeit minute, this might be the last promise I’m able to keep. And I can’t. Mom and Dad are going to be fine. Nothing’s wrong with them, they just had to leave in a hurry, for their safety, and ours for some reason. I know it’s a lie, but I have to say it to keep myself sane. I pull out the crumbled-up faded post-it Mom had written and read the words again. The scribbled words have so much power inside of them. So much love and trust and good will. Mom and Dad have so many more years’ experience than me living and surviving in horrific situations. They’ll be fine. It was the right thing to do. They’re safe. Thinking anything less will paralyze me and puts Tomas at risk. But still, all I can think about is what I saw before we left Restelicë. The scene of our home completely torn apart, like a beast ripping the ribcage of our shared chest open with its claws. Our belongings broken and scattered across the floor haphazardly. It wasn’t the home Mom, Dad, and I built together over the past half a year; it was a crime scene, an echo of a life we had, now ruined. Everything pointed towards something having happened to my parents, not just them leaving us, but them being taken against their will. And knowing the dangers in Kosovo, dangers that literally made their way into my safe haven, why would I be stupid enough to put myself in more danger by mailing a dumb letter? Why would I put my boyfriend at risk, too? That’s what Tomas would be asking me if he was awake. In Tomas’ defensive, his opposition would be valid. Especially since putting myself in danger puts him in danger, and that’s not what his parents signed up for when they left their son in my family’s care. When Tomas’ parents left for an important work trip and allowed their son to stay with me for two weeks, running for asylum wasn’t part of the deal. No, everything about this and my desire to keep some asinine promise to my sister, who would rather me be safe than risk my life, is stupid. The sound of a window shattering a street or two over and the animalistic cheering from the crowd confirms that. It would be stupid—no, idiotic—to go out just to mail a letter. Something I could hand to her when I see her after we land at IAD and she’s there waiting for me. There’s no guarantee the postal service here is even working. Which shouldn’t be my biggest concern, while outside our window people rebel against sleep at 2 A.M. It looks like New Year’s Eve in New York City out there. Except it’s early March in Kosovo. My mind struggles with the choice: mail the letter now, or hand it to her in person. Tomas and I would be leaving for Pristina early. Daybreak, he announced some time ago in that stern ‘you have no way to disagree’ tone he loves to use. We want to get to the Embassy as quickly as possible, he reasoned. And who knows what we’ll encounter on the road? Tomas Sousa, the Portuguese God of Logical Reasoning. Tomas Sousa, the boy who held me tightly just forty-five minutes ago. Tomas Sousa, my beautiful, amazing boyfriend who gave up leaving Kosovo with his family to stay with me. The same boy who grunted in disapproval when I shifted our positions earlier but decided this time he was okay with being held. I’m willing to bet my life he would say it would be smarter to mail the letter in the morning. That’d be his preferred option. But the walk to the post office might do me some good. Not only that, Anna deserves to know what happened. Or rather, what could happen. Fourteen letters. That’s how many I’ve sent her in the past six-ish months. It seems almost irresponsible to not mail the last one. Tomas is confident we’ll make it out alive. Then again, he’s always confident. But if we don’t, one more letter won’t hurt anyone, right? I refuse to become one of those ‘unsolved mysteries’ like Amelia Earhart or JFK. The hostel Tomas was able to get us through his expert haggling has been our home for the past few hours. Just long enough to get some rest. Or really, long enough for Tomas to rest. I pretended to sleep until he drifted off, but a walk would do me just as much good as sleep does him. Always the dramatic one. My beautiful, funny, sarcastic, dramatic one with brown, now long, hair. Hair that I used to tug on to wake him up—no matter how much he hated it. How could someone who takes up so much space with his infectious smile, his sharp wit and conviction, which manifests like a glow, look so small, so vulnerable in sleep? Smiling, I cross the room and lean over the bed for a moment, pressing my lips against his cheek. His skin is a deviation warmer than my own, as if his body still retains the heat from the Sao Paulo sun that fuels everything that makes him, him. He mutters something under his breath once more—I think it’s my name. His arm reaches out, curling around my waist. This time, when he speaks, I hear it. If only it was that easy I think, combing my fingers through Tomas’ locks. Grabbing the edge of the blanket, I pull it up to his shoulders, tucking it into his sides. To Tomas, going out would be a needless danger. He doesn’t understand—or refuses to accept—the intense bond Anna and I have. His family isn’t the same. Engineers don’t experience the same things USAID workers do. That closeness? That bond? I don’t expect him to get it. Tomas opens his mouth to protest, but a well-placed, searing kiss against his lips shuts him up. “Quatro minutos,” I promise him. Tomas starts to sit up. I can see the gears turning. His argument forming, his rusty-with-sleep joints shifting awake. The life in him being stoked. I know how this’ll play out. He’ll insist on coming with me. Walking on the street-side of the sidewalk. Keeping watch and casting judgement on every person who comes too close. He stares in that unblinking way before settling back in bed. “Eight” He mutters, before drifting back to sleep. If I could bottle that smile, I would. The world deserves to see it. Find a way to use it to power a nation, release it into the world to help the victims of the Rwandan Genocide a few years back. His smile could solve so many problems. How lucky am I to have it all to myself? Stuffing the envelope into my pocket, I silently slip on my shoes. I looked around the room for my jacket, tempted to turn on the light to find it, but settle for taking Tomas’ instead. Plus, it smells like him. The chilly air hits me like a thousand small needles, threatening to freeze my skin and rust my bones. But the noise that has only grown since we arrived keeps me alert, and prevents the cold from taking root in my body. I can’t pinpoint exactly why I’m so anxious. I’ve been in more dangerous places. Cities on the verge of riots thanks to no potable water. Half-abandoned towns where gangs were becoming the new face of law. Each time we were on the peripheral edge of danger. Just close enough to feel threatened, but not so close I ever truly felt my life was in peril. I’ve always had my Mom and Dad with me, even Anna, to help me get through situations like this. Things were never as bad because we were together. Those were, as my mom and dad called them, great teachable moments. For what, exactly, I never knew. Peeking my head out from the alleyway I look both ways before exiting and heading across the street. The small town vibrates and the walls hum while people march in the streets. Six and a half months—Six and a half months in Kosovo and never had I seen a town so…unified. It feels like the same energy I remember in Berlin, but with the tension of strained, bent metal, like in South Africa during Apartheid, threatening to snap. Threatening a revolution. Though it doesn’t snap; it cracks. The hive of people standing a few blocks over cry out after the sound of exploding glass and erupting flames. The fire bounces off the walls, like a natural nightlight, mapping out the city. Most of the people in the streets are not much older than me. They carry signs written in Albanian. I can’t make out full sentences, just a few words here and there. But enough to see what they are demanding and rioting for. Justice. Independence. Freedom. Serbia. Yugoslavia. Some men and women have patches sewn into their clothes. Red and yellow circles with what looked like a two-headed snake with wings in the center. It looked like a hastily thrown together symbol, but the majority of people in the crowd are wearing it; at least, some of the loudest chanters. It doesn’t take long for my staring to attract attention. Which is expected. A Black teen staring in a country that has…probably less than a tenth of a percent of Black people? I should have known better. Keep your head down, Mills, I tell myself, keeping to the shadows and moving quickly. Don’t be an idiot. The small mailbox, situated outside of the post office, is a block and a half past the commotion; right next to the payphone I saw when we drove into town on the motorbike. I take a moment to check the payphone again, to see if it’s magically started working in the last few hours since we got to Therandë. Of course it hasn’t. Getting in touch with the Embassy wouldn’t be that easy, now would it? Distracted, I don’t notice the surge of people walking down the alleyway until one of them bumps into my shoulder—hard. “Sorry,” I say, putting my hands up in an apology and tilting my head down. Quickly, I repeat it in Albanian and then again in Serbian. Just to cover all the bases. Keeping to the wall, I walk against the flow of people. It’s funny, well not really funny, but interesting, how riots start. The people in the street don’t look like people I’d peg as rebellious. They’re wearing overalls and faded dirty jeans, old Backstreet Boys and Spice Girls shirts that obviously came from America secondhand. Their bodies are more jagged and rougher than most, worn and tired from hard labor, and oppression. But the conviction painted on their faces while they march, the determination to do something when they’ve done nothing for so long, is strong. I keep my head down as I head to the mailbox, keeping my hand against the uneven wall as a guide. The sea of people in the street, yelling curse words and chanting some uneven rhyme about justice, makes my skin crawl. Mob mentality is a powder keg, I remember my father teaching me. You want to get as far away from them as possible. Not because you can’t handle yourself, but because there’s no way of telling what you’ll have to handle. Yet I’m walking practically into it. Smooth move, James. Just half way down the road, three people are fighting, their screams louder than the chanting. Others are being pulled into it, like how ink spreads, slowly and evenly. Luckily, my destination is only a few paces ahead. Never have I been so happy to see something so rusted and old looking before. A scream as a bottle collides with someone’s head. More people yell. A person is thrown into a window. Each action flows seamlessly into the next. The energy on the street is contagious. But the crisp edges of the letter, with only a few symmetrical and well-meaning folds, reminds me why I’m out here. I pull the rusted door downwards, the whining of metal swallowed by an ominous chant. Kissing the envelope, my chapped lips linger on where the flap sticks on the back. “Find her,” I whisper, dropping it in the mailbox. As the watch the letter get swallowed by the darkness, I think about Anna. What’s it going to be like when she receives that letter and reads it, realizing her parents are missing? Hopefully, we’ll be home, or at the Embassy before then, and I can call her; let her know they’re okay. That we’re all okay. Hopefully the last thing she’ll learn about her biological mom and dad doesn’t come from a hastily written letter by her adoptive brother. That’s the last thing I remember before an explosion of heat, wind, and shrapnel sends me flying back into the wooden door of the post office, knocking the breath out of me.